The Last Kingdom has been confirmed to be returning for a third season, airing exclusively on Netflix. The historical epic series is based on The Saxon Stories books by Bernard Cornwell. 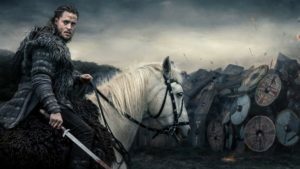 The saga recounts the life and adventures of the warrior Uhtred of Bebbanburg, particularly his complex relationship with King Alfred the Great and his struggle to reconcile his Briton birth and Danish upbringing. The first two seasons aired on BBC Two while Netflix came in late 2017. The third season is set to premiere later this year exclusively on Netflix. Season one was based on the first and second books, The Last Kingdom and The Pale Horseman. Season two then adapted the third and fourth novels, The Lords of the North and Sword Song. According to Den of Geek, season three will have ten episodes, two more than usual, most probably adapting the next two books in the series, The Burning Land and Death of Kings. Since there are currently ten books in the series (and Cornwell confirmed that he is working on an eleventh), if all goes well, there is enough material for a few more seasons. The series is full of compelling characters, a complex plot, and thrilling action scenes so seeing it continue is always a treat for fans. Those who have read the books should have even more reasons to be excited for the next season. Cast members who are confirmed to return for the next season are Dreymon, David Dawson as King Alfred, Ian Hart as Father Beocca, Emily Cox as Brida, and Tobias Santelmann as Ragnar the Younger. With the growing scope of the next two novels, more new cast members will surely be joining them. Stay tuned for more news on The Last Kingdom season 3.